Duplex is one of the coolest venues in Prague to dine, dance and party the night away at. 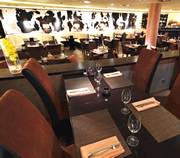 Situated atop a tall building in Wenceslas Square, the restaurant affords its visitors terrific views over the city. Then at 10pm Duplex transforms into an exclusive club. 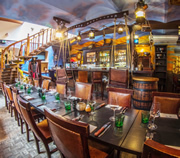 TIP: Get free club entry when you book the restaurant through Prague Experience. 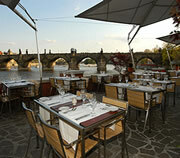 Hergetova Cihelna Restaurant is set in a prime location by the river. 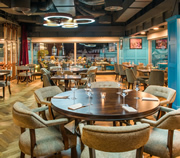 This stylish, modern eatery offers fine views of Charles Bridge and across to the Old Town. 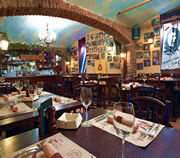 The atmosphere is sophisticated, but not imposing, helped by soft, upbeat background tunes. A cool place to dine, and popular with all age groups. It also has a separate children's area for families. Sherwood, close to Wenceslas Square, is one of Prague's hidden gems. 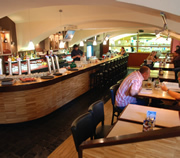 It is a modern restaurant with a friendly ambience, serving gourmet Czech and International cuisine at budget prices. It also stocks a fine range of beers, wines and cocktails. A projection screen and TV's show live sports and music videos.